Yes, it's time. The time of year when we must take inventory. Not the one where we count the merchandise of our showrooms. Nope. We must take inventory of ourselves. Yep, you and me. For them, it conjures up another 4-letter word, RISK. These people like to live in their own personal comfort zones, thank you very much. They are happy to settle, because nothing, N-O-T-H-I-N-G is worth the PAIN (count 'em 4 letters) of venturing outside the zone. Risk, and change fall into the same category, and they don't want to play. For retail managers, sales and design associates who just Go On About Life; doing well = complacency. They end up going with the status quo. They settle. Every task or challenge they face takes on a life of its own and seems too difficult to bear. Each opportunity may seem to be imbued with too much risk. These people, when faced with risks, often choose not to take a chance. Does Your Company, “Me, Inc.,” create an emotional bond with its customers? Does your strategy stand out from the crowd? Are you (your company) fun to work with? Are you as disciplined as you are creative? Are you setting yourself apart? Are you making a difference for tomorrow? Let your biggest competitor be You! Compete with yourself on a daily… make that an hourly, basis. Setting goals is easy. They are about what you could do. They specify what you plan to do. Where it gets tricky is what you actually do. This is where most of us “humans” get stuck. It's almost like we're super glued in place! We want to move but, we're just stuck! Here is how Keith Yamashita in his terrific book, “Unstuck” defines the dilemma of being stuck. “Being stuck is all about human feelings. It's about feeling overwhelmed, exhausted, directionless, hopeless, battle-torn, worthless, or alone.” Wow! No wonder we don't want to move! Description: Too much going on, not enough time. picture? What's working now? Avoid getting overwhelmed, crazed and going into overdrive or freezing. Either mode is not helpful. Description: You're paralyzed, burnt out. Action Plan: Look at your watch. Companies that measure results against the time invested tend to out perform the competition. Description: No big picture. Action, but no results. Action Plan: Put your ideas in words. Articulating it will help you see potential problems that can then be addressed. Description: The passion is gone; you lack purpose. Action Plan: Come up with a moon-shot - a big, ambitious goal to motivate you. Description: You're at war with yourself or your competition. Action Plan: Choose a common enemy before moving forward. Description: Poor metrics make measuring success impossible. Action Plan: Prototype the end objective rather than constantly debating where you're going. Description: You're not in sync. Action Plan: Use public recognition and praise as a motivator. One thing you might want to get “stuck on” is Yamashita! 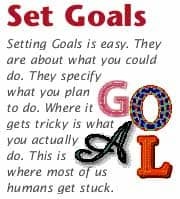 Setting goals so that we know where we're going is a terrific way to leave the land of gluedom! Become Different, But Don’t Join The Circus! This concept is exciting and directed to all of you on “that limb.” What an adventure what an opportunity. How about you? Are you going to set your goals to join “the cause” that the possibilities are endless? It's a terrific way of reaffirming that you can do whatever you want to do, and be whatever you want to be! If you are now convinced that you want to join “the revolution,” you need to be careful before you participate in the activities under the big tent! Clowns refuse to measure their results, because measurement implies that they accept the reality of the outside world. Wishful thinking is not a replacement for the real world. Only clowns can get away with that. Clowns Don't Plan Ahead: Sea monkeys don't plan ahead, either. The only species that regularly demonstrates foresight is humans, but we manage to do this only on occasion… They work hard to maintain the illusion that everything is just fine - until it's not. We've all seen a clown burst into tears when he stubs his toe. Those same manic clowns are overcome with glee and laughter when something goes right for them. We can all be considered clowns in this regard. Clowns Aren't Very Nice To Each Other: Clowns are most famous for willfully inflicting harm upon their fellow clowns. Whether it's a water bottle or a slap on the side of the head, these acts tend to get the biggest laughs. If clownhood is our natural state (and I think it must be), then the alternative must be the anti-clown. Success lies in rejecting your inner clown and adopting a long range view of the world (even if it's just for five minutes longer than your competition). What would Chuckles or Bozo do? Figure out the behavior of a real clown - and do the opposite. In their book, “How Full Is Your Bucket,” Tom Rath and Donald Clifton emphasize the importance of filling your bucket with positive thoughts. When your bucket is full you attract people with positive energy. This energy feeds on itself. It's a winning combination for the sender and the sendee! “The Magic Ratio - 5 Positive Interactions for every 1 Negative Interaction.” If you can manage to stay above this ratio, your bucket will remain full. However, positive approaches must be grounded with reality. We DO live in Kansas, NOT Oz! “A 'Polyanna' approach, in which the negative is completely ignored, can result in a false optimism that is counterproductive. There are times when it is absolutely necessary to correct our mistakes and figure out how to manage our weaknesses.” That's why setting goals on a regular basis, and dwelling in anti-clowndom are so important. “Be a Spin Doctor:” Put the best twist on your job performance. “Work Obsessively at Your Craft:” Be obsessive. Be passionate. Don't let anything stand in your way. You're going to fall down. Getting up is what separates the pros, the people who excel. All the rest just exist. Which one are you? “Embrace Ambiguity: You have to be able to change course without a bead of sweat, or remorse. All bets are off. You just can't 'deal with' constantly slipping and sliding circumstances; you actually need to thrive on ambiguity. Eleanor Roosevelt is quoted in Jon Meecham's great book, “Franklin and Winston,” as saying that “Franklin just can't wait to get into the Oval Office every morning because he loves the game so much.” You need to love YOUR game! “Never Be Satisfied:” Re-imaging Brand You is not a one-time thing. You need to revolutionize your portfolio of skills. This is a minimum survival necessity. Uprooting yourself may be painful, but it's also exciting. Become distinct by bee-ing a “Buzz Agent” for your Company, “Me, Inc.” Hey, What's the Buzz? Brag a little. Brag a lot! Get your clients “buzzing” about you. Dietrich Mateschitz, the marketing genius who turned Red Bull into a $1.6 billion company, says it's all about “buzz marketing.” Word of mouth is the most effective weapon in your arsenal. When you are a professional who is passionate about what you're doing for your clients, it's just natural for devoted fans to become your “hive of buzzers!” You get an ROE. Not a Return on Investment, but rather a “Return on Evangelism!” Yep, that's right, everyone will be singing praises! As Seth Godin says, “ You just have to start. Start now. Fail often. Enjoy the ride, make something happen!” Come on. Find that limb! Start swinging!